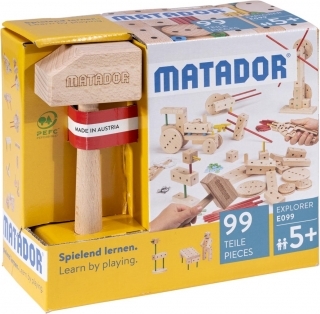 The smallest Matador Explorer construction set completes the Explorer series. With its 99 parts and 42 construction ideas it offers the perfect introduction. Windmill, tractor, bird and many other models promote the development of our children’s creative and motor skills. The E100 is a good basis from which further ideas can grow. Dragster car, gymnast and merry-go-round are only a few of the many model ideas of the E100. First mechanical models can be built and grasped in how they function. 222 parts incl. tools and building manual. Playing with Matador will prepare you for life! 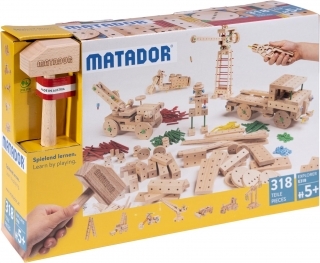 Build your own Matador Harley and cruise through the countryside, hammer on your crane and load the lorry you constructed yourself, or just build according to your imagination! Nothing is as beneficial for a child’s healthy development as being able to play freely and animatedly. 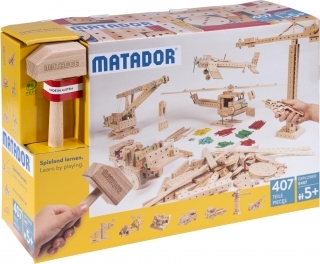 The Matador Explorer E200 with its 318 parts incl. tools and building manual, inspires our children’s imagination and to think in three dimensions. The windmill clatters, the helicopter is about to land, the builders are working diligently, and the crane operators are moving heavy loads. There is a lot going on with E300! The E300 with its 407 parts incl. tools and building manual promotes technical and physical understanding. It is fun to learn while playing! The premium construction set will turn you into an explorer and adventurer! Build a pirate ship and sail the oceans or drive your XXL juggernaut along the motorway. The E500 provides endless and long-lasting building fun for children from age five up until old age. Easy models but also complex, technically sophisticated structures can be constructed. 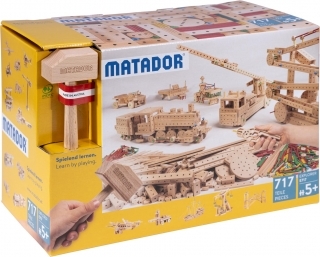 Endless ideas with the Matador E500 and its 717 parts incl. tools and building manual. A full load of building fun! With the Explorer XL groups of children can playfully explore the world of technology. This set includes everything one needs for creative construction. 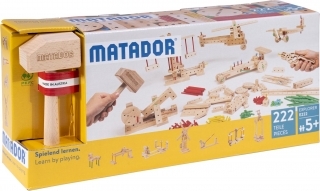 Blocks in various shapes and sizes, connecting pins in different lengths, wheels, axles, a building manual and natural tool sets to play together in a team. 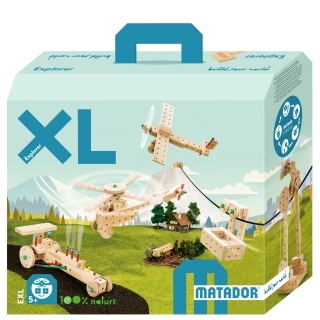 MATADOR XL is ideal for families, groups of children, kindergarten, child care facilities, etc. The large set is recommended for up to three children.